As you search for a personality assessment to catalyze and add value to your team building session, first validate the accuracy of the assessment itself. If you are looking to build a sound architectural structure, it's essential to begin with a solid foundation. Keep in mind that a team building session is not merely a light-hearted break from your daily office routine-- it's an exercise that can impact your organization's productivity, success, and bottom line. *This post is a shortened version of Chapter 2 from our 44-page eBook on Teams. If you find this information helpful, check out the full chapter in the eBook for more tips, diagrams, and guides. After you’ve had a chance to identify the type of assessment you’ll need to accomplish your team's specific goals, dive vertically into the background and backing of each potential assessment. Not all assessments have supporting robust, scientific research, and an assessment that provides inaccurate data causes more problems than it solves. 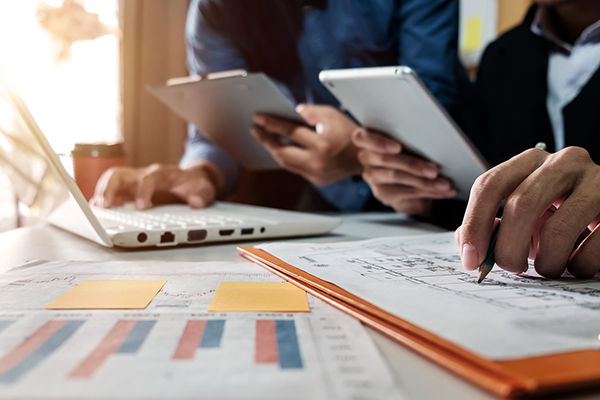 Let's dive into the importance of tapping into a valid and reliable assessment, as well as how you can determine the accuracy of an assessment's results. During your search, it is imperative you take both the reliability and validity of an assessment into consideration. Without these two key elements, the data may be inconsistent and inaccurate, making it difficult to draw concrete conclusions about individuals or teams, the roadblocks they may be facing, and how to successfully overcome them. 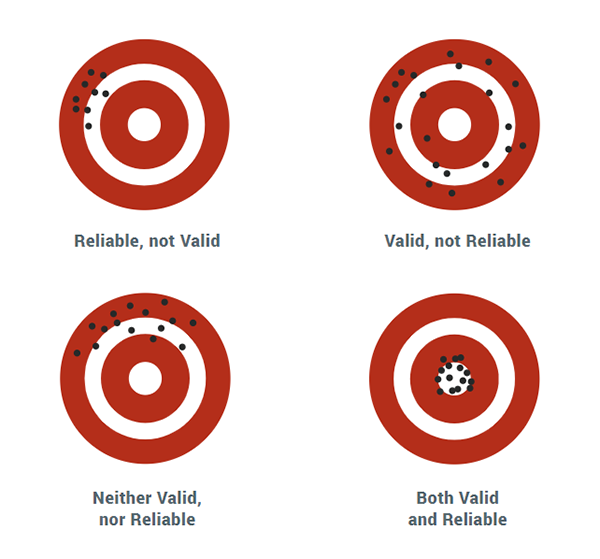 To reinforce the importance and characteristics of reliability and validity, take a look at this illustration. When an assessment is both reliable and valid, it is measuring exactly what you want it to measure—hitting the mark to make the biggest impact with your teams! Any reputable assessment company should be able to provide you with thorough documentation that verifies the reliability and validity of their tool. If you are unable to find this information, regardless of how legitimate the assessment may seem, question the extent to which you will be able to trust the results. As you move forward with validating an assessment, consider these determining factors. 1. Test-Retest is when the same assessment is given to a group of people twice with a fixed amount of time and no feedback provided between each administration. The results from each session are compared to see if there is a positive correlation between each set of scores. 2. Internal Consistency Reliability is when the items (questions) used to create each scale are compared to see if there is a positive correlation. If you are planning to use the assessment’s results to supplement decisions within your organization, you need to be confident that you are basing these decisions on data from a reputable source. In other words, is the assessment valid—does it measure what it is supposed to measure? 1. Face Validity is the most basic type of validity and is defined as the sheer appearance that the results are relevant, important, or make sense to the test taker. This is an important area to consider as it is essentially the perceived accuracy of the assessment—do people tend to agree with their results? 2. Convergent Validity refers to the strength of the relationship between two assessments that measure the same attributes. For example, if you were comparing two assessments that both measure someone’s assertiveness, you would expect to see a high correlation between these two scales. 3. Divergent Validity is very similar to convergent construct validity except that it refers to the strength of the relationship between assessments that measure different attributes. If you were to compare a personality assessment to an intelligence test, you would expect to see a low correlation between these scales—they cannot have a strong relationship if they are not measuring the same thing! a. An individual who has taken an assessment is followed into their careers to determine if they perform at the predicted level over a period of time. b. The scores of one group of people are used to create a prediction, while the performance of a second group of people are evaluated based on that prediction. With a stronger understanding of how to determine the validity of any behavioral assessment, you should be able to select reliable assessments that can contribute to effective team building sessions. This topic is featured in the second of our three-part Assessments for Team Building eBook series. Get all the information you’ll need to select an assessment, so you can save time and focus on what matters--optimizing your team! Download the eBook today!